Generally, the warmer months (beginning from September and peaking in December) are the most popular months for solemnising marriages in South Africa. 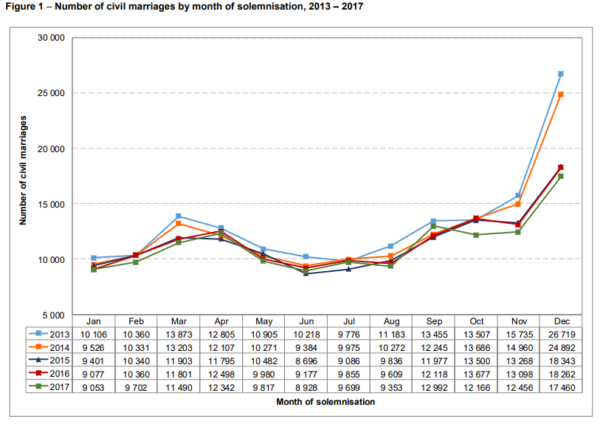 The data shows that the solemnisation of marriages has a second peak in March or April – depending on the month of the Easter holiday for that particular year. In 2017, the highest number of marriages (12.9%) took place in December and the lowest number of marriages, (6.6%) occurred in June. Marriage solemnisation can only be conducted by marriage officers who are appointed in terms of the Marriage Act. Civil marriages are generally solemnised by civil marriage officers at the offices of the DHA and by religious marriage officers at chapels or religious buildings. While a large proportion of South Africans opted for a religious marriage (28.8%), more than twice as many South Africans solemnised their marriage at the Department of Home Affairs (58.1%). In South Africa, minors require the consent of a parent, a guardian or a commissioner of child welfare before entering into a marriage. In addition to the above consent, boys younger than 18 years and girls younger than 16 years of age require the consent of the Minister of Home Affairs before they can get married. In 2017, marriages of 2 bridegrooms and 70 brides aged less than 18 years were registered, with 62 of these brides marrying for the first time. The median age of widows was fluctuating between 30 years and 32 years during 2013 and 2017. According to Stats SA in 2017, there were 25,390 completed divorce forms processed – indicating an increase of 0.3% from the 25,326 processed in 2016. 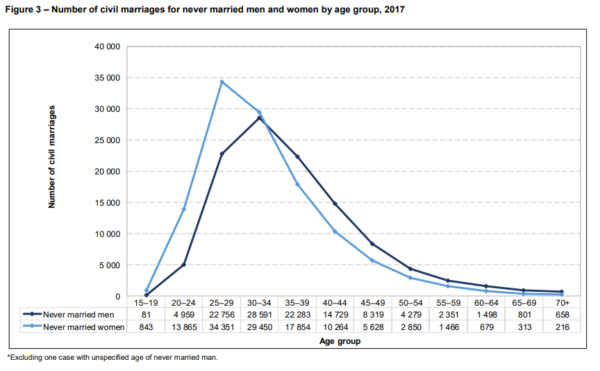 Unsurprisingly there were more female (51.0%) than male (35.0%) initiators of divorce, with the median ages at divorce in 2017 at 44 years for men and 40 years for women. 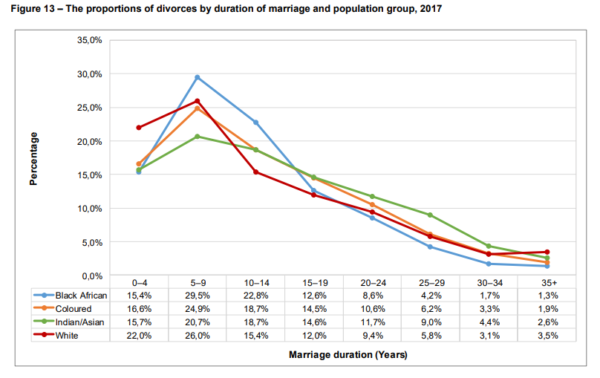 The findings show that four in ten divorces (44.6%) of the 25,390 in 2017 came from marriages that did not reach their tenth wedding anniversary. In 2017, there were 14,121 (55,6%) divorces with children aged less than 18 years affected. *Divorce Attorney Cape Town is a division of Simon Dippenaar & Associates Inc. (SD Law). We are passionate about the law. Based in the heart of Cape Town, our family lawyers and divorce attorneys offer expert legal advice with complete client confidentiality. Our expertise encompasses family and divorce law, and a comprehensive range of legal services. Founder and director Simon Dippenaar holds a BBusSc LLB degree and Professional Diploma in Legal Practice from the University of Cape Town, and is an admitted attorney of the High Court of South Africa. Simon Dippenaar & Associates Inc. has law offices in Cape Town and Gauteng and represents clients in South Africa and further afield. This entry was posted in News and tagged Divorce Statistics. Bookmark the permalink.